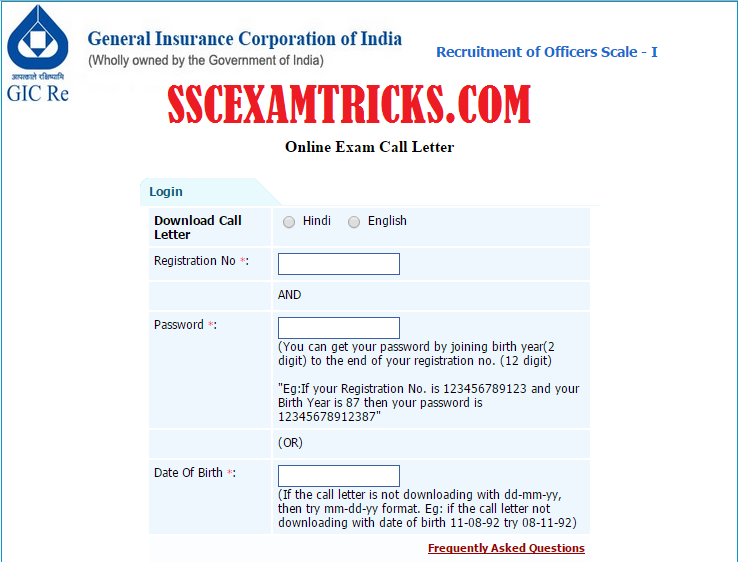 SscExamTricks.com: GIC Admit Card Re-exam 2015 gicofindia.com AM Officer Scale I Hall Tickets. GIC Admit Card Re-exam 2015 gicofindia.com AM Officer Scale I Hall Tickets. 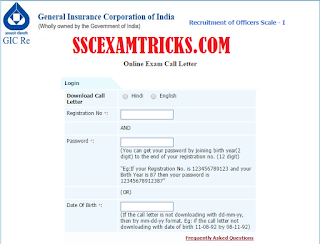 GIC Admit Card Re-exam 2015 gicofindia.com Download GIC Re-exam Call letters - Download GIC AM Officer Scale I Hall Tickets. General Insurance Corporation of India (GIC) had cancelled GIC Exam 2015 which was held on 01st March 2015 and had released official notification on 18th May 2015 for conducted of Re-examination. The latest information has released on official website in which an official notification has released which contained GIC Re-exam Date for Assistant Manager Officer Scale 1. GIC Re-exam is going to be held on 12th July 2015 at various centres in metro cities i.e. Chennai, Delhi, Kolkata and Mumbai. It is latest that GIC Admit Card 2015 for Re-examination has become available on 22nd June 2015 on official website. Those candidates who had appeared in examination held on 01st March 2015 are required to attend re-examination. Candidates can download GIC Admit Card Re-exam 2015 from direct link given here. Earlier GIC had conducted written examination on 01st March 2015 in which a total of 163 candidates have qualified for group discussion and personal interview. GIC had declared result on 24th March 2015. Due to certain reasons, GIC had re-scheduled re-examination on 12th July 2015 for 65 posts of Assistant Manager (AM) Officer Scale I in various disciplines i.e. Actuary & Executive P.A disciplines, Aeronautical Engineering, Chemical Engineering, Electrical Engineering, Human Resource Development, Information Technology (Software), Legal, Marine Engineering, Medical, Computer Secretary, Insurance, General, Finance Accounts, Statistics. The date, time & venue of GIC Re-examination 2015 will be mentioned in GIC Admit Card Re-exam 2015. A huge numbers of candidates are going to reappear in GIC Re-exam 2015. Those candidates who are going to appear in GIC re-examination 2015 for Officer Scale I; they can download GIC Admit Card Re-exam 2015 for AM Officer Scale I from the direct link given here. GIC Admit Card Re-exam 2015 Important Instructions: It is mandatory to produce GIC admit card 2015 (downloaded by website and printed Hard copy affixed with Colored passport size photograph) before getting entry into the examination hall. No candidate will be permitted to appear in the examination without GIC admit card 2015.GIC 2015 Admit card will be checked along with valid photo identity proof of the candidates at the venue of written examination by duty officers. Candidates are advised to reach at the venue 20-30 minutes before the exam time. Late coming candidates reach at the venue of examination centres will not be allowed to appear in written examination. Final selection for Seat Allotment Admission of the candidates - On the basis of candidate's performance in the online examination and GD & Personal Interview. Candidates will be invited for personal interview which will be conducted along with verification of original documents. No candidates will be allowed to enter without interview call letters. · OBC Certificate should be in proper format and issued by competent authority within one year after date as mentioned in the advertisement.